Air Force One is getting a patriotic new paint job. 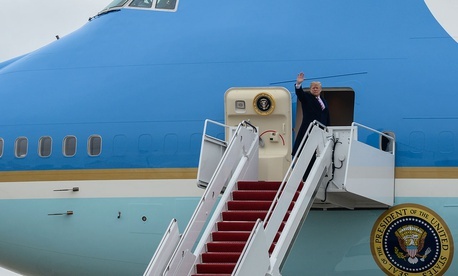 President Donald Trump has ordered up a new Air Force One—two of them, actually—which he plans to have painted red, white, and blue, rather than the blue-and-white color scheme that has graced the president’s plane since John F. Kennedy was on board. Trump announced the new presidential aircraft in an interview with CBS last week. The aircraft is expected to be delivered in 2024, Bloomberg reported. That means Trump will only get to enjoy it if he wins a second term. If someone else wins the 2020 election, they might choose a different paint job. Boeing is developing the two 747 jumbo jets that will serve as Air Force One. The manufacturer inked a $3.9 billion contract to build the aircraft, according to Bloomberg. The deal was informally made in February and officially announced last Tuesday. It comes after years of contract negotiations between Boeing and the Air Force that runs the aircraft. Trump first inserted himself into the talks shortly before taking office in January 2017.